I spoke to a freelance reporter not too long ago about how I bike with my girls in our Cristiania trike. The article came out yesterday (with big inaccuracies, including where I live and the number of kids I have!). Here's the article. I read it yesterday and was more or less pleased, apart from the errors. Any parent who drives through traffic with a child in one of those little, flimsy trailers ought to have his / her head examined. I would suggest parents use and encourage their children to use this path rather than putting their safety at risk riding busy streets. Biking on busy streets, intersections, with children is not a great idea. These parents are selfish people. They don't want to give up their own enjoyment of riding a bike so they strap their kids in some little 2 wheel contraption behind the bike and tell everyone how great it is for the kid. You see that's the problem with these stupid green tree huggers. It's all about their needs and how they don't want to miss out on their enjoyment. When you raise children, their needs and safety come before your own. This last one is my favorite. Geez. There were a few supportive comments there as well, but the narrow-mindedness of these people really horrifies me. So here we are on our interminable flight home to Boston from Florence via Paris. We had a GREAT time at the Fattoria degli Usignoli with the guides. We did a lovely group ride on Friday, with some great hills and lots of twisty turnies. A bit too much traffic, but the nice smooth pavement just about made up for that. Then, once the meeting was adjourned, the sun made an appearance and Lauren and I went for a nice leisurely ride to Via Setteponti - undoubtedly one of the most beautiful roads I've ever ridden! It's part of two of our tours - Tuscan Fantasy and Assaggio Toscana. Here's a short video I shot. Then we met Paolo for dinner at the Fattoria's wonderful restaurant. The charming owners were at the next table, and I was sure to extend my compliments to them and let them know that I hope to be back with the girls later this summer! For dinner, had pasta with sausage and olives, then wild boar with white beans. Mmm! Or is it day 2? Very hard to tell. Lauren and I left Boston early Wednesday evening, now it is approaching 8pm on Thursday, 6 hrs ahead. The flights were uneventful, except for a slightly hair-raising dash across Charles de Gaul airport to the new terminal G2 for our connecting flight to Florence. But all was fine in the end. Of course, I didnt sleep one single wink, so I was already pretty tired. After Davide picked us up and took us to the Ciclismo HQ in Montevarchi. We relaxed there for a bit, then the three of us plus Suzie headed out on a ride. And what a ride! We headed out to Radda in Chianti and then to Castellina before turning around and riding back. Davide and Suzie had some work to do back at the office, so Lauren and I sought out a lunch place in Radda. We wound up at a little bar, where we gorged ourselves on sandwiches, gelato (Lauren had two cups! ), and coffee. The ride itself was perfectly breathtaking. All typical Tuscan scenery, with beautiful rolling hills, villas, cypress trees, olive groves, and vineyards. Radda was also wonderful, and I recognized it as soon as we rolled in. I had already been there with Lauren, probably 15 years back. 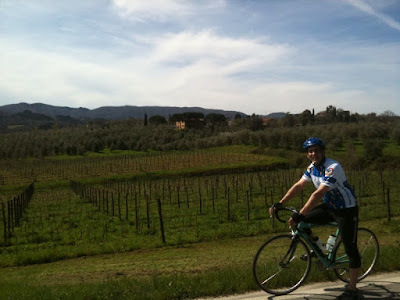 Apart from the scenery and the company, the most remarkable aspect of the ride was the HILLS. From Montevarchi, there is a climb of about 10 miles, varying steepness, but not insubstantial by any means. There were more hills after that as we headed in and out of Radda, but this long one is quite different from the short, sharp climbs I am used to in New England. In any case, heading up was not too bad at all - but the ride home was nothing short of awesome! There is simply nothing like cruising through all those switchbacks! The other remarkable thing is that I did all this using energy from who knows where - I still have not been to sleep! Now we are off to dinner, then with any luck, I will have a normalish bedtime and be all aclimated for a great day tomorrow.